When my kids were little – I definitely had to do something that I know was wrong. Use food as a motivator. No, I didn’t bribe them with food – but if they had a “shout out” at night (when they would get out of bed and wake us up in the middle of the night, or come downstairs after it was bed time), we would take away dessert. My girls were so obsessed with dessert – that they only seldom had “shout outs.” Of course if there were multiple “shout outs” during the night, they would loose dessert for a progressively longer time. I remember the worst was when I had to take away dessert for two weeks. Those were a very miserable two weeks. The begging was tough to watch, but I stayed strong and we got through it. 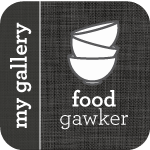 It definitely helped keep me motivated to make treats – because when there was something really worth eating, the likelihood of a “shout out” was slim to none. Oh the games we play… But hey, it worked, and we actually felt like we had trained them, we felt like geniuses. I was always looking for healthy treats though – because my girls loved their fruit almost as much as they loved their baked goods. Cooking Light printed this recipe for a fun twist on a pina colada. The recipe in the magazine actually had alcohol in it, but I knew that my kids would go nuts for these – so I made these without alcohol. This would have been the ideal dessert to make when they were younger and they were in that phase (minus the sharp sticks that is) – I am sure they would have slept well all week, just to get their hands on these. The best part of course was the gelatin squares. Boy were those refreshingly delicious. Now if I could only figure out a way to motivate adults to behave well…then I would really be a genius. Spread coconut on a baking sheet. Bake at 350° for 7 minutes or until golden, stirring after 4 minutes. Combine coconut, coconut cream, coconut milk, sugar, and salt in a saucepan. Bring to a simmer over medium heat (do not boil). Remove from heat; cover and let stand 20 minutes. Place coconut water in a medium bowl; sprinkle gelatin over top. Let stand 5 minutes or until solid. Cut coconut mixture into 72 cubes. 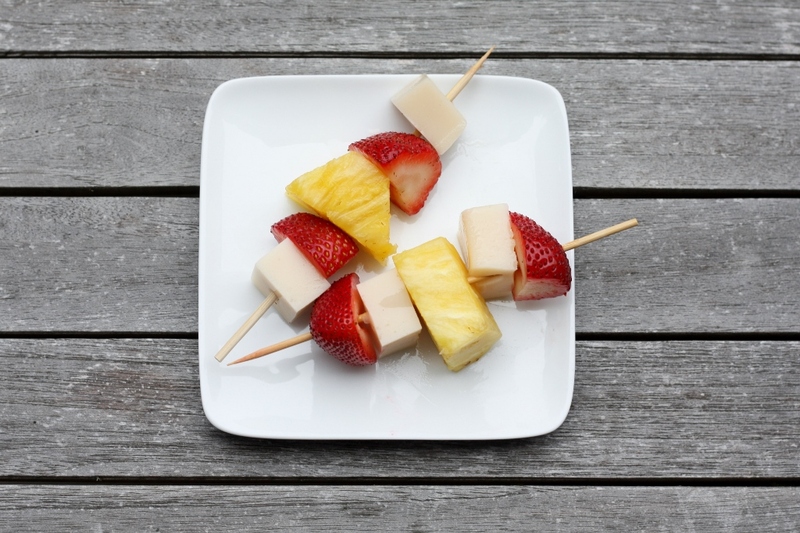 Thread 2 pineapple chunks, 2 gelée pieces, and 1 strawberry half alternately onto each of 36 skewers.